1. I have Sonic Digital Media Plus v7. I believe I got it in a bundle with Muvee Auto Producer 6. I have created a slideshow with music and burned a DVD, total time 36 minutes. When the DVD plays, at approximately 8 minute intervals, the music stops, the counter on the DVD player goes back to zero, the drive makes a couple of clicking sounds, the picuture on the screen at the time remains, and then everything picks up exactly where it left off. This happens about every 8 minutes. 2. I've tried to go to Support to download any available upgrades but the downloads fail. Is this because I've never actually purchased Sonic Digital Media Plus v7. I can't find any updates listed on the updates page for Digital Media Plus. Can you tell me where these downloads are? - a link or description how you got there, and how they fail? Then I can explore that and see if I can help with them. Hello Brendan. Thanks for the reply. I open My DVD Plus. I go to Help. I click on check for updates. It says checking for updates. Then is says failed to update. I think I realize now that this means there are no updates available. Sorry. I still have the problem with the gap in the music though. I've tried 2 or 3 times, but I'll again now to see if it continues. Yes, that does mean there are no updates. If you get an "OEM" bundled version like this it's rare to have updates, but if there are any then they come from the company which gave you the software. They're also supposed to provide you any "Official" support rather than Sonic/Roxio - although the discussion boards are here for everyone. Okay, that's updates out of the way. I can't think of anything to explain why your DVD should pause like that, except for a marginal or poor burn, and then I would expect it to be more random than regularly every 8 minutes. Does it do the same on each of them? -what brand of disc are you burning on, and what speed are you burning at? Can you try another type/brand of disc, and burning at a lower speed? Thanks again for your reply and sorry for not getting back to you sooner. I had to go out of town unexpectedly for a few days. I've played the DVD on 3 different DVD players - two Sonys attached to my TV and one Sony portable DVD player. The same situation on all of them - about every 8 minutes, the music stops for a couple of seconds, the picture stays where it is, the counter goes back to zero and then it all starts back up right where it left off. I've also played the DVD on a computer -not the one that I used to make the DVD - same thing but the hesitation is a little less obvious - just a little hang up and then off it goes again. Burning speed is 2.56 at the beginning and then goes up to 4.0. I'm using Memorex DVD+R 4.7 GB with write speed at 16X. I'm going to be out of town again, leaving tomorrow morning and coming back on Monday sometime. Since you're the only one who's replied, I'm beginning to think I have something really strange going on here!! I don't know what's causing the pauses on your DVD, although it sounds like it could be due to burn quality. What a lot of people don't realize is that there are a lot of errors generated when burning to disc - even under the best conditions. When the disc is played the error-correcting systems can usually fix errors in the data stream as it comes in, so you never notice. If a particular frame can't be fixed, many players will just show the previous frame twice and you won't notice. Here's a scan of an excellent quality burn [99% quality score. Cdanteek is the only person I know who consistently burns discs this good.] That's one of the best I've burned, but notice all the errors? Blue in the top pane, green in the bottom. All those can be corrected during play. Now, if there are too many errors on a particular part of a disc or they're too serious to correct, you can get behavior described as 'jumping', 'sticking', 'freezing' and the like as the player goes through the area with the potholes. Like this one:- The really bad errors show yellow and then red. 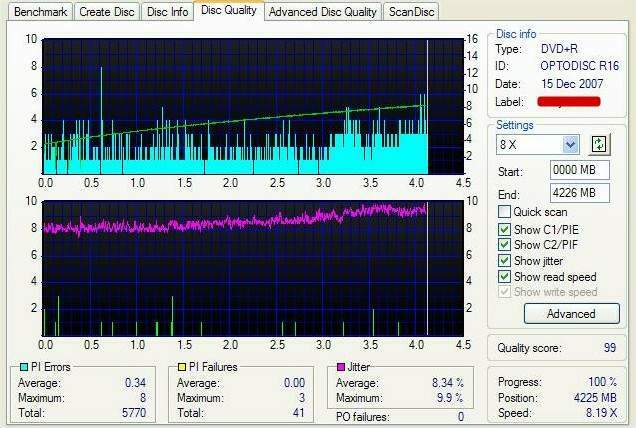 Memorex discs can be variable. They're made for Memorex by different manufacturers, and the best manufacturer doesn't always win the bidding. It wouldn't hurt you to try a better quality disc for your burn, and perhaps try it at a 4x burn speed. Can I suggest you try some of those things and burn another DVD. If it plays cleanly then burn quality was the likely problem, and you've fixed it. If your new DVD plays up every 8 minutes or so then we have a problem with the data stream being sent to your burner. Hello Brendon and thanks again for all the information. I have to admit that I know nothing about burning DVDs except telling the program to do it and waiting for it to pop out. I didn't know you could scan a disc to show the quality of the burn. How do you do that? I must have mentioned somewhere along the line that I'm using the DVD burner in my laptop, an HP Pavilion, about 5 years old, but never had a problem before. Is it customary to use any other kind of external dvd burner for these kinds of projects? I took your advice and defragged my C drive and my G drive which holds my slideshow. My D drive didn't need defragging. I also used a lens cleaning disc to clean my lens - a "TDK CD LensCLEAR". I then tried burning another DVD. Burning speed started at 2.6 and quickly went to 4 and stayed there. And exactly the same hesitation has occurred. The only thing I didn't try from your suggestions was a different brand of DVD. It'll be a little while before I can get out to buy another brand. Which would you suggest? It just seems so strange - I've burned hundreds of DVDs, all different brands over the years, and I've never had a single problem. I was sure I answered your last post, but the Invision Board was playing up again that day so my answer might have been swallowed. We scan the discs with a useful program we used to be able to download free. Please send me a PM by clicking on the little envelope below my photo at the left of this message, and I'll discuss that with you. I don't know that it's customary to use external burners for anything. People I know have got them because they have more than one machine and can switch one drive between machines. Others have got one because they want to update their present burner but don't feel up to popping the top of the machine and installing a new internal one. It's up to you, really. Fine on the defragging. I usually reserve a lens cleaning disc for last resort cleaning, if I can't blow dust off the lens. The usual mounting of internal drives usually has the lens facing up, which seems a bit silly to me. There is a small possibility of a brush cleaner disturbing the lens mountings, hence the last resort comment. 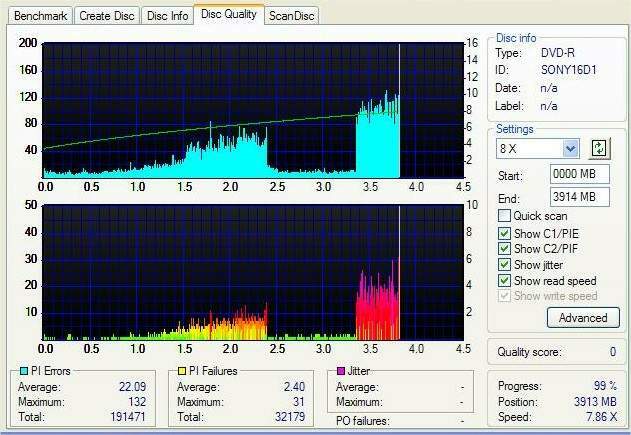 Tell me please, what burning speed did you have set for that disc which went to 4x and stayed there? Was the new DVD you burned simply another copy of the problem one, or was it a new compilation altogether? [trying to rule out the way the disc was assembled before it was burned]. I like Taiyo Yuden, Verbatim, Imation discs usually, but I'm limited to what's available where I live. The main thing I try to do is get a type of disc that my burners like [i test them to see which brand burns best at what speed and in which burner] and then I stick to that type where possible.